I believe the hardest part of having diabetes and skating on a team wasn’t as much the managing of glucose levels, but worrying that you are letting your teammates down. Tuesday, May 29, 2001, my life changed forever. I was in fourth grade working on a math problem when the phone in my classroom rang and my teacher said my mom was here to pick me up. I was instantly excited, because I got to leave school early! When I got in the car my mom said we were going to go to the doctor because she thought I had something called “diabetes.” My sister had worked at a day camp and had a camper who was diabetic and therefore was able to recognize some of the symptoms of diabetes I was exhibiting. While my family was pondering over what the diagnosis of diabetes meant, I was just concerned about getting to my play date later that day. Just a few hours later I was rushed to the hospital and admitted to the pediatric unit where I got poked and prodded all day and night. Little did I know that this day would just be the beginning of my new lifestyle. Fourteen and a half years ago, I never imagined that having Type 1 diabetes would shape me into the person I am today. I have become more responsible, determined and appreciative. I never have ever let Type 1 diabetes stop me, and I never will. 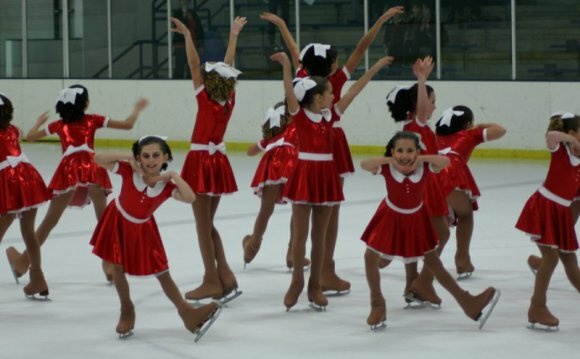 I began my ice skating career with the Starlights Synchronized Skating Team in Buffalo Grove, IL in 2001. The Starlights were my second family; the rink was my second home, and my teammates were my best friends. When I say I am a synchronized ice skater many people ask me: “So is synchronized skating like synchronized swimming?” “Can you do a triple axel?” “Are you going to the Olympics?” Synchronized Ice Skating is an upcoming discipline of figure skating and not widely known. It combines all areas of figure skating where a team of 16 individuals step out on the ice and perform a short and long choreographed program in synch. I skated with the Starlights until I graduated from high school. Then I went to Western Michigan University to continue synchronized ice skating with the Bronco Skating team where I made the senior level, (the highest level of synchronized skating), and cross-skated (skating on two different levels) to the collegiate level as well. During graduate school I joined back up with the Starlights and for the 2014-2015, my last competitive skating season, I cross-skated for the Starlights on their senior and adult teams.